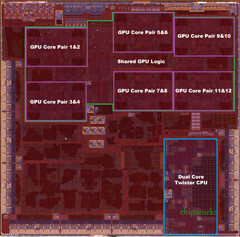 The A9X chip on the iPad Pro has received the teardown treatment in order to see what is inside. The iPad Pro's A9X chip has been taken apart by Chipworks to see the internals. The first interesting find is that the A9X has a custom 12-cluster graphics processor that effectively doubles the graphics power of that found in the iPhone 6s. The size of the chip is also nearly twice as big as the one found in the iPhone 6s, but it has allowed Apple to fit the powerful dual-core inside, as well as a faster storage controller for better read and write speeds. Apple likes to use real-world comparisons to show the power of its chips rather than specific technical specs, and have claimed that the iPad Pro's A9X is faster than 80 percent of all laptops and portable PCs shipped in the last year. Apple also has claimed the chip is twice as fast as the chip in the iPad Air 2, which certainly may be the case after looking at the chip in the teardown. 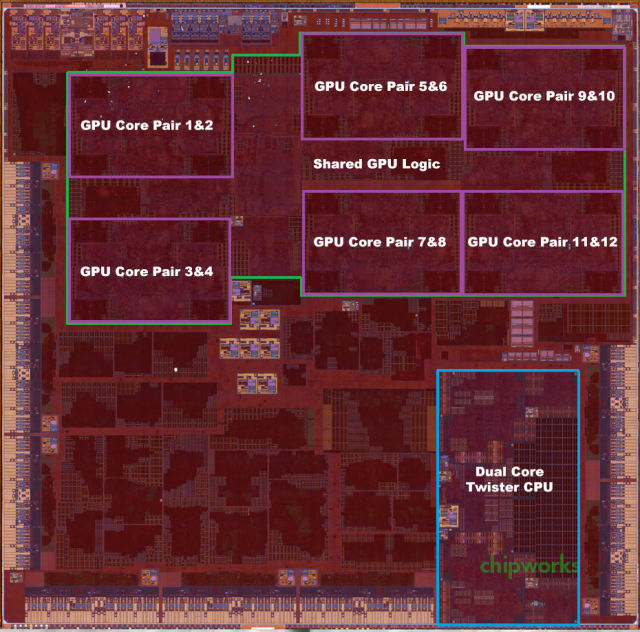 Imagination Technologies believes the iPad Pro's GPU has the same performance of the Nvidia GeForce GT 730M, which is just a bit less powerful than what is shipping in Apple's more expensive MacBook Pro laptops. iOS could be the largest factor keeping the latest iPad from becoming a laptop replacement, but this could change in the future.